The Turkish Investment fund is trading 13.13% discount to net asset value (NAV). It invests mainly in stocks of Turkish companies. It is under the advisory of Morgan Stanley Investment Management Inc and is currently managed by Paul Psaila and Eric Carlson. The CEF has total net assets of $118.4 million. The annual expense ratio is 1.05%. Its dividend yield is 1.93% and is distributed annually. This top performer emerging markets cef has returned 18.27% over the past decade and 35.98% over the past 1-year. It has YTD return of 48.92%. The fund benchmark is MSCI Turkey Blend. 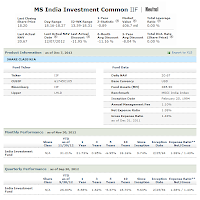 Since its inception in 1989, this TKF fund has returned 6.50%. The fund’s NAV is $19.04. The top 6 stocks in its holdings as of September 2012 are Turkiye Garanti Bankasi AS (21.31%), Anadolu Efes Biracilik Ve Malt Sanayii AS (11.47%), Haci Omer Sabanci Holding AS (7.35%), Tupras Turkiye Petrol Rafinerileri AS (7.28%) and Turkcell Iletisim Hizmetleri AS (5.17%). The top sectors as of June 2012 are Financials (44.09%), Consumer Goods (22.64%), Industrials (10.97%), Telecommunications (9.21%) and Oil & Gas (6.84%). This Mexico Equity & Income fund objective is to seek total return. It utilizes its assets to purchase a portfolio of equity, convertible debt, and other securities issued by Mexican companies. The fund manager is Maria Eugenia Pichardo since 1990. This closed end fund has no dividend yield (i.e. 0%). 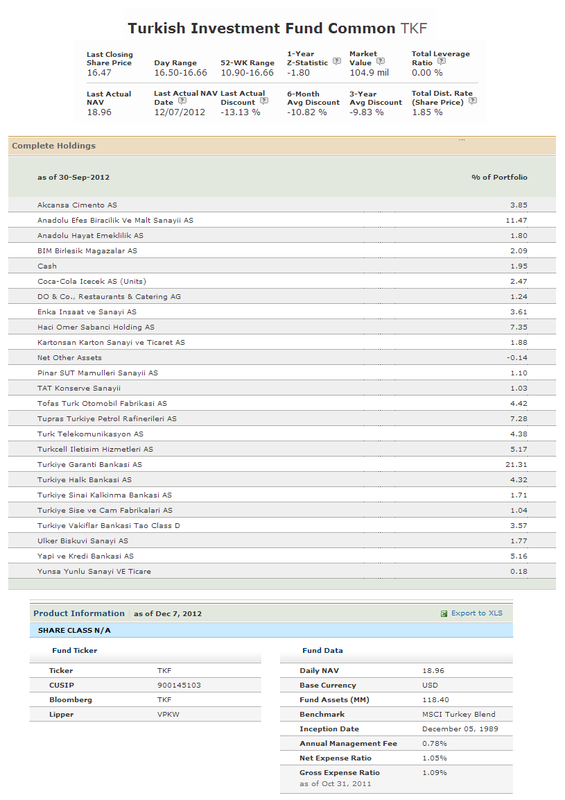 The most recent dividend income was in December 2010 with $0.023. It has total net assets of $92.9 million. Its market price is traded at 11.99% discount to its fund NAV. The fund also has expense ratio of 1.57%. As per the third quarter of 2012, the top portfolio holdings of this MXE fund is America Movil SAB (21.49%), GPO Carso SAB DE C (6.84%), ALFA SAB DE CV (6.81%), El Puerto De Liver (6.80%) and GPO Mexico SA (5.44%). The top sectors as of June 2012 are Consumer Services (19.97%), Industrials (17.49%), Telecommunications (11.68%), Non Classified Equity (10.29%) and Consumer Goods (9.16%). 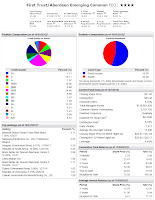 Mexico Fund is similar to Mexico Equity and Income fund. Its investment aim is to provide total return by investing in equities listed on the Mexican Stock Exchange. The fund manager is Impulsora Del Fondo Mexico SA De CV. Its dividend yield is 9.41%. The third quarter distribution of 2012 was given in October 2012 ($0.596) and the forth distribution is due in January 2013 with $0.6262. It has 1.42% annual expense ratio. This top performer emerging markets closed end fund has year-to-date return of 36.72%. The 5 year annualized return is 6.58%. 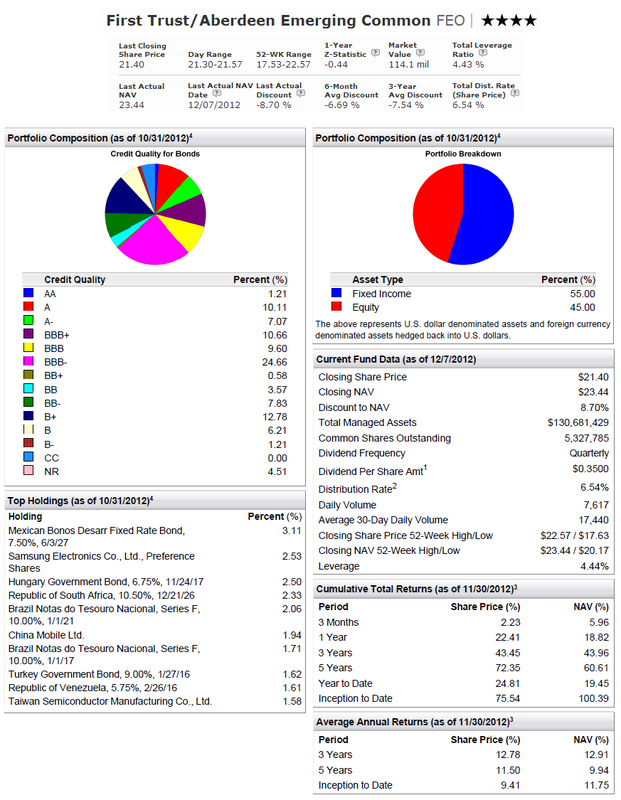 This closed end fund is ranked with 3 stars rating by Morningstar. Bolsa Index and MSCI Mexico Index are used as the fund benchmarks. As of April 2012, the top 5 stock holdings are America Movil SAB de CV ORD (15.11%), Fomento Economico Mexicano SAB de CV ORD (8.65%), Wal Mart de Mexico SAB de CV ORD (7.90%) and Grupo Mexico SAB de CV ORD (6.58%). The top sectors are consumer goods (23.79%), consumer services (17.21%) and telecommunications (16.08%). This Morgan Stanley India fund uses its assets to buy Indian equity securities. The fund’s CUSIP number is 61745C105. Its total net assets are $384 million. It also has 1.34% expense ratio rate. Morningstar rates this CEF fund with Neutral rating. The annual holdings turnover rate is 49%. The current shares price is $17.89. This best performing emerging markets CEF has year to date return of 29.91%. It has returned 14.61% over the past 1-year and 19.30% over the past 10-year. It is currently traded at -11.95% premium of its fund NAV. The annual management fee is 1.10%. The top 5 stocks as per September 2012 are HDFC Bank Ltd (9.32%), Hindustan Unilever Ltd (5.67%), Cash (5.63%), Cognizant Technology Solutions Corp Class A (4.24%), ICICI Bank Ltd (4.19%) and ITC Ltd (4.01%). First Trust/Aberdeen Emerging Opportunity fund invests most of its assets in a diversified portfolio of stock and bond of issuers in emerging market countries. This fund has an effective leverage of 4.71%. 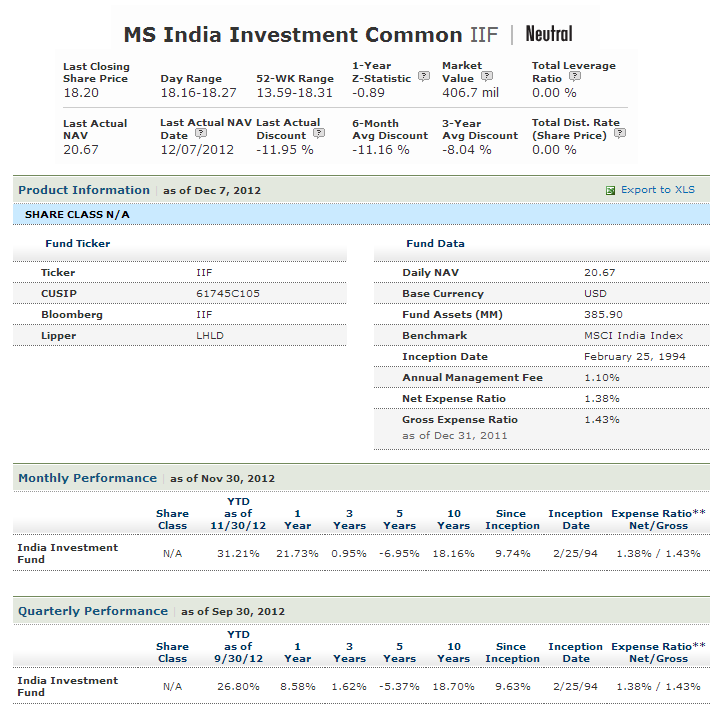 This fund market price is traded at -8.70% premium to its fund NAV. It also has dividend yield of 6.61%. This dividend is paid quarterly. The YTD return of this fund is 26.35%. Morningstar has ranked this top performer emerging markets CEF with 4 stars rating. Its top holdings by issuer as of October 2012 are Mexican Bonos Desarr Fixed Rate Bond (3.11%), Samsung Electronics Co Ltd (2.53%), Hungary Government Bond (2.50%), Republic of South Africa (2.33%) and Brazil Notas de Tesouro Nacional (2.06%).